Over the weekend Berkshire Hathaway released their 2015 Annual Report and the most sought after Letter to the Shareholders from Warren Buffett. Buffett's investment and business track record is truly amazing with 19.2% annualized gains in book value and 20.8% annualized gains in share price from 1965-2015. Compared to the S&P 500's 9.7% annualized return that is an outstanding track record of beating the market. Every year this nondescript looking annual report is likely the most coveted by investors. Buffett shares his investing and business knowledge and has a knack for putting it into the simplest terms. "Berkshire's gain in net worth during 2015 was $15.4 billion....Over the last 51 years, per share book value has grown from $19 to $155,501, a rate of 19.2% compounded annually." Buffett has his own measure of success and it has nothing to do with the share price. There can be vast disconnects in the value of the business (6.4% gain in 2015) compared to the market value (12.5% decline in 2015). Focus on the business and the market value will take care of itself over the long term. In reference to Berkshire Hathaway Energy, "That company...now owns 7% of the country's wind generation and 6% of its solar generation. Indeed, the 4,425 megawatts of wind generation owned and operated by our regulated utilities is six times the generation of the runner-up utility." Renewables and alternative energy is going to continue to grow in use, scale and efficiency. Whether that makes the generation, transmission, or generation components the best investment candidate remains to be seen. "With the PCC (Precision Castparts) acquisition, Berkshire will own 10 1/4 companies that would populate the Fortune 500 if they were stand alone businesses." I think it's easy to forget the size of Berkshire Hathaway and just how difficult it is to grow the business with acquisitions. "Berkshire also owns Kraft Heinz preferred shares that pay us $720 million annually...That holding will almost certainly be redeemed for $8.32 billion in June. That will be good news for Kraft Heinz and bad news for Berkshire." Warren loves his cash flow and dividends even if he doesn't come out and say it. Dividends, much like the float from the insurance business, allows for constant building of cash reserves for investment. "In case you think these seemingly small change aren't important, consider this math: For the four companies in aggregate, each increase of one percentage point in our ownership raises Berkshire's portion of their annual earnings by about $500 million." Both active (new investment capital) and passive (share buybacks) building of positions is vital to long term investment success. I did find it interesting though that IBM and Wells Fargo were the only two of the big four that were actively added to while Coca-Cola and American Express only grew through share buybacks. "All families in my upper middle-class neighborhood regularly enjoy a living standard better than that achieved by John D. Rockefeller Sr. at the time of my birth. His unparalleled fortune couldn't buy what we now take for granted, whether the field is - to name just a few - transportation, entertainment, communication or medical services. Rockefeller certainly had power and fame; he could not, however, live as well as my neighbors now do." We really do live in the best times to have ever been alive in the history of the world. "As much as Charlie and I talk about intrinsic business value, we cannot tell you precisely what that number is for Berkshire shares (nor, in fact, for any other stock). It is possible, however, to make a sensible estimate." When valuing a company you don't need to be precise, rather it's the idea and direction that needs to be correct and a general idea of future results. "I will commit more errors; you can count on that." Even one of the greatest investors of all time makes mistakes. The important thing is to acknowledge the mistake and reexamine your process to identify if you can make improvements to avoid future mistakes. You can read the full 2015 Annual Report here. Have you read through the 2015 Shareholder Letter? Will you be making the trip to Omaha for the annual meeting? What other companies have must read annual reports? Thanks for highlighting the key takeaways, JC. i still havent read the whole report - just had the time to skim through and read some takeaways in the media. It is really easy to forget how big BRK is -- and that growth comes at a slower pace. But those acquisitions and the assets are accumulating with a great record. Hoping to start a position in BRK -- and break away from my dividend-only companies rule. It's really incredible to watch what Buffett has been able to create within Berkshire but I think that all of us dividend growth investors strive to create a legacy as he has done. 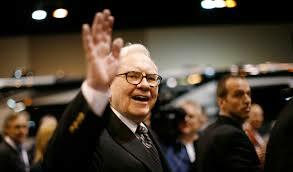 It's important for us to remember as Buffett states in his report that we're all going to make mistakes but over the long term as long as you have done your evaluation correctly on the companies you invest in as a whole, you should come out ahead once the market levels out over the long haul. Thanks for posting these notes - they further drive home the ideas that were stated in the annual report. There is a reason people listen to what he has to say. BRK is just a machine, and it is being run by the best in the business. I appreciate his KHC comments too, a lot.